Sat-nav coordinates: Croan Cottages are located at N52.47474° (52° 28.488') & W -7.27157° (-7° 16.292'). Croan Cottages are situated in rural south Kilkenny between the villages of Dunamaggan and Knocktopher just 500m off the R699. 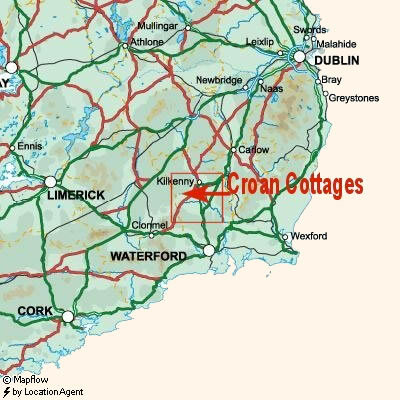 Croan Cottages are approx. 20 minutes drive to the South of Kilkenny City in Ireland's 'Sunny Southeast'. Our self catering cottages are easily accessed from the airports and sea ports of Dublin, Waterford, Cork and Limerick. Golf, fishing, shooting, horse trekking and walks are all local to Croan Cottages and other water or adventure sports can be enjoyed on the Waterford coast (20 miles). Local services are provided for guests in Croan Cottages in the villages of Knocktopher (3 miles) and Dunnamaggan (2 miles) in County Kilkenny. We can help guests staying in our holiday homes arrange transport for trips to Kilkenny city, Mount Juliet Hotel and championship Golf Course and a selection of quality restaurants nearby. Local pubs providing music, craic and serving quality food all day are located just a short distance away from the cottages. The closest picnic areas are in Castle Morres (Castlemorres, Castlemorris) Forest Park and alongside the river in Knocktopher. Leave the airport on the N1 South (toward the city). Leave the N1 at the first exit on to the M50 motorway (South). Cross the Toll Bridge (€3 toll is paid online or over the phone) and continue to the N7 (Naas Road) exit (South). Continue on the N7 to the M7 motorway. Take the M9 motorway exit from the M7 (left filter lanes signposted for Kilkenny and Waterford). Stay on the M9 to exit 10. Leave the motorway at exit 10 and turn right at the roundabout. Go straight at the next roundabout. Turn right at the Y junction (signposted for Croan Cottages). Take the 2nd left (again signposted for Croan Cottages). Croan Cottages are 500m on the left. Take the N7 (Naas Road) from the city centre or from the M50 motorway to the M7. Take the M9 motorway exit from the M7 (left filter lanes signposted for Kilkenny and Waterford). Stay on the M9 to exit 10. As you leave the port follow the signs for City, South and N7. Travel up the quays and continue to follow signs for 'The South' and N7. Take the N7 (Naas Road) to the M7. Take the M9 motorway exit from the M7 (left filter lanes signposted for Kilkenny and Waterford). Stay on the M9 to exit 10. Take the Waterford Road (N10) from the city or from the ring road to the M9 Motorway (signposted for Knocktopher and Waterford). Exit the M9 at Exit 10 (R699 Knocktopher). Turn right at the roundabout on to the R699 toward Callan. Pass straight through the next roundabout. Turn right at the Y junction (signposted for Croan Cottages). Take the 2nd left (again signposted for Croan Cottages). Croan Cottages are 500m on the left. Take the M9 North from the city to exit 10 (R699, Knocktopher and Callan). Take exit 10 and turn left at the roundabout. Turn right at the Y junction (signposted for Croan Cottages). Take the 2nd left (again signposted for Croan Cottages). Croan Cottages are 500m on the left. Take the M8 toward Dublin as far as junction 10. Exit at junction 10 (signposted for Waterford). Follow the signs at the roundabouts to the N24 toward Waterford. Stay on the N24 around Cahir and Clonmel to Carrick on Suir. In Carrick on Suir turn left at the Garda Station traffic lights on to the R697 to Kilmoganny. In Kilmoganny take the right turn at the end of the village (after the church) toward Newmarket on the R701. Approx. 3 miles (5km) outside Kilmoganny pass the 'Grand Gates' at Castlmorres and take the next left across the small bridge (signposted). Croan Cottages are 500m on the right. Take the N19 east to the N18. Turn right onto the N18 to Limerick. From Limerick take the N24 through Tipperary and Cahir to Clonmel. In Clonmel continue on the N24 to the N76. Turn left onto the N76 toward Kilamerry, and Callan. Turn off the N76 at Callan into the town and follow the signs to the R699 toward Dunamaggan (Dunamaggin, Dunnamaggin) and Knocktopher. 2.1 miles (3.4km) after the village of Dunamaggan take the right turn at the top of the hill signposted for Croan Cottages. Croan is 500m on the left. Exit the Ferry terminal and continue forward onto the N25 and through Kilrane. At the Rosslare Road Roundabout take the 1st exit onto the N25 (signposted Cork). At the Duncannon Road Roundabout take the 2nd exit onto the N25 (signposted New Ross, Enniscorthy). At the New Ross Road Roundabout take the 1st exit onto the N25 (signposted Cork, Limerick) and continue on the N25 through Barntown to New Ross. In New ross, turn left onto the N25 (signposted Waterford) and at the roundabout take the 2nd exit onto Belmont Road - N25. Continue on the N25 to Waterford. Take the M9 North from the city to exit 10 (R699, Knocktopher and Callan). Take exit 10 and turn left at the roundabout. Turn right at the Y junction (signposted for Croan Cottages). Take the 2nd left (again signposted for Croan Cottages). Croan Cottages are 500m on the left.